Shutterfly, online at Shutterfly.com, is your one stop shop for personalized photo gifts and accessories. With a huge online store to choose from, you can make your very own creations. Whether you want to make a photo book to remember your favorite vacation, a mug to celebrate your favorite person, a calendar to keep track of your year, or Holiday cards to show off your family, Shutterfly.com is the place to start. Shutterfly also offers great deals and discounts on photo printing. Also, with your free Shutterfly membership, you can enjoy free and unlimited picture storage. Stop by RetailSteal.com and take advantage of the latest and greatest Shutterfly coupon codes, Shutterfly discounts, and Shutterfly promotions. Shutterfly.com often offers free shipping coupon codes and discounts. Check back often for the most recent shipping offer. See website for full information on returns. Act now and take advantage of free shipping on your order of $29+ from Shutterfly.com. Use coupon code at checkout to save. Shop at Shutterfly and enjoy 30% savings on cards. Click here for code. Shop at Shutterfly and enjoy 40% savings on photo books. Click here for code. Shop at Shutterfly and enjoy 40% savings on photo books, stationary, greeting cards, photo gifts, and home decor. Click here for code. Shop at Shutterfly and enjoy 20% savings on photo gifts. Click here for code. Shop at Shutterfly and enjoy free expedited shipping on orders $30+. Click here for code. Click link to shop the sale section at Shutterfly.com and you can save up to 50% off a great selection of stationary. For a limited time only shop at Shutterfly to save 50% on large prints and posters. Click to save. Shop at Shutterfly and receive up to 20% discount on home decor. 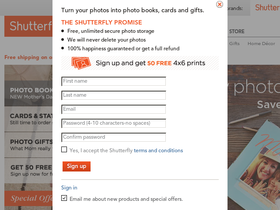 Sign up for a Shutterfly membership and they'll reward you with 50 free photo prints. Click link to sign up. Graduation is coming up, save up to 40% now when you shop at Shutterfly.